Marcello Fantoni lamp base, made in Italy circa 1960’s. This is a Stunning and Rare Marcello Fantoni lamp base, made in Italy circa 1960’s. A Fabulous mid century modernist design. 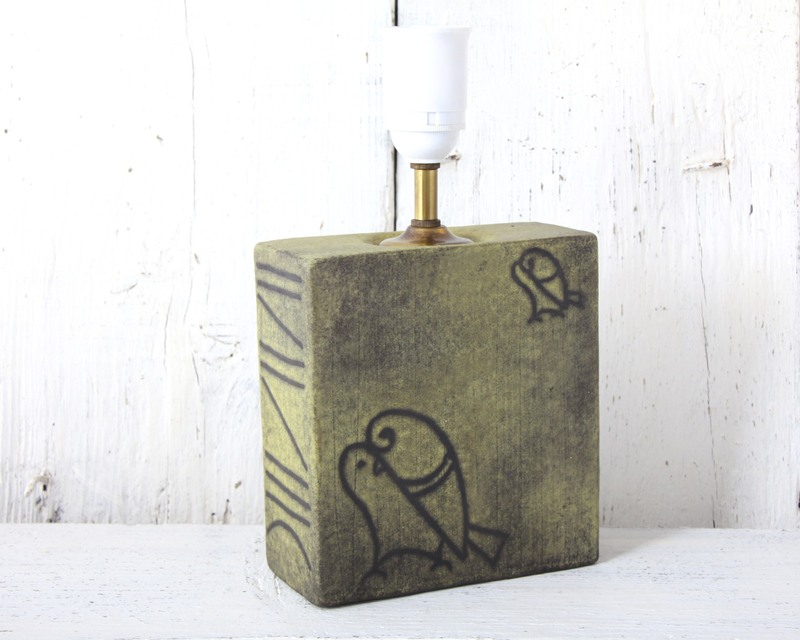 The bold rectangular solid form of the ceramic lamp base in mottled shades of green and black is decorated with abstract motifs, resembling love birds, and a tribal style line motif on one side. The lamp fitting sits in a recessed well on the top, and the wire comes out of a hole on the side. Marcello Fantoni was one of the greatest ceramicists and designers of the 20th century, his pieces (as can be seen here) were influenced by ancient Etruscan ceramics, and by contemporary modern artists of the mid century era. Incorporating elements of Modernism / Cubism and Abstraction, this led to his pieces being included in collections of international Modern Art museums and galleries. A Wonderful practical lighting / display piece, and would look great in any 60’s, retro, vintage, mid century modern, modernist, minimal or contemporary interior. 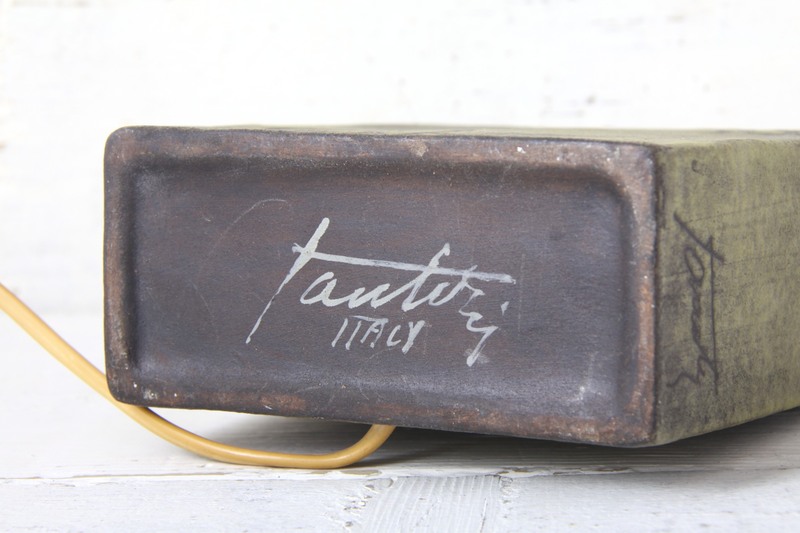 A Great addition to any collection of Fantoni / Raymor / Italian / European art pottery or 20th century design. Fully working, lovely original brass fitting, wiring and bulb holder could be replaced to suit your requirements. As with all vintage electrical items, should be rewired and tested by a professional electrician. In Excellent Condition, no marks, chips or scratches to the pottery, some age related patina to the brass, doesn’t detract from the overall look. The base measures 16 x 15 x 6cm / 6.25 x 6 x 2.5in. Height to top of bulb holder is 26cm / 10in. 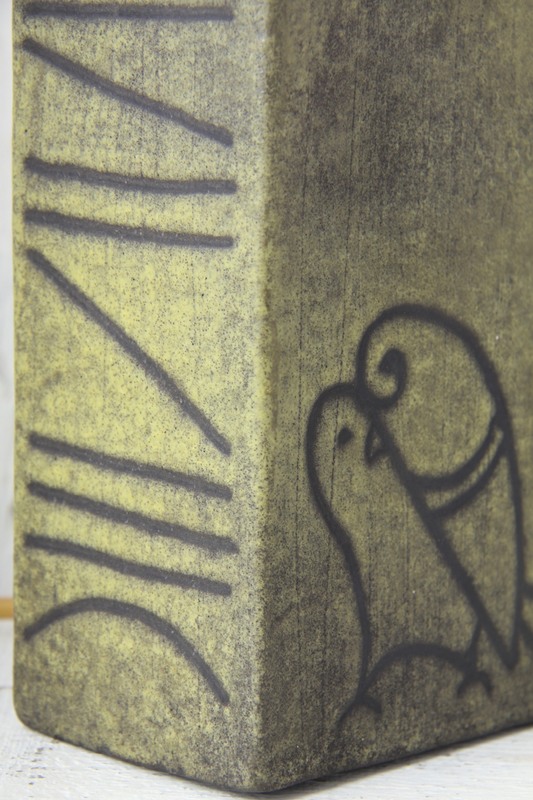 Hand marked to the base Fantoni Italy, and also incised mark Fantoni to side.